Since December of last year the Arctic sea ice has been breaking records with the lowest ever ice cover – lower than the shocker melt down of ice in 2007. This is the latest update from NOAA’s National Snow and Ice Data Center. 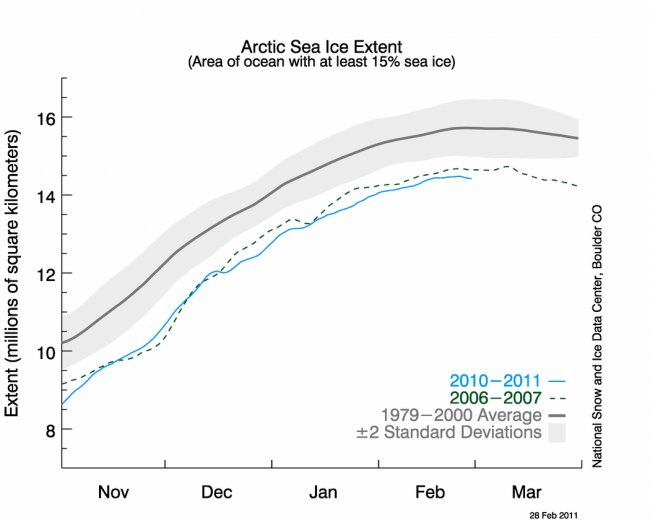 It shows that the seasonal extant of Arctic sea ice at the end of February, 2011, stood at a record low, well below the prior record set in 2007 and almost 3 million square kilometers below the average for that winter date, when sea ice is usually within days of its greatest seasonal extant for the year. what does this mean for the minim in mid September? Hard to say– will we surpass ice loss of 2007? I was wondering the same thing. However, do we know why the ice suddenly dropped in 2007? I wonder if me might have another super rapid melt this spring like 2007….. The warmer the world gets; the faster it gets warmer……right? 2007 was a very hot summer in the Arctic with a big high pressure system keeping things warm and sunny. It was unusual. We don’t know yet if the rate of warming will increase. If feedbacks are strong from the loss of sea ice, melting of permafrost then the rate of warming could increase. I follow NOAA’s 30 and 90 day forcasts but it only shows the US 50 states. What is the prediction for the Arctic this summer? Especially by Greenland.